On September 8, 2018, I wrote about waiting for Florence. By September 11, I had weighed the odds and listened to the mandatory evacuation issued by Carteret County. 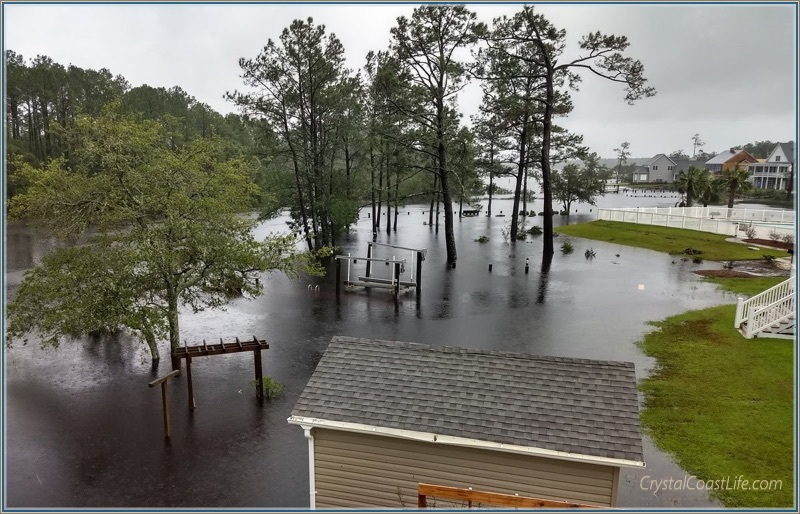 We evacuated and did not return to Carteret County until September 19, just before the most direct route here was closed down by flooding in Kinston, NC. While we were fortunate to be able to spend time with our grandchildren, family, and wonderful friends, our trip was not a vacation. It was more like a stresscation. There were some wonderful beds on the trips, but a good night’s sleep was elusive because my mind was always back here at coast. When Florence was a category 4 storm, we wondered if we would have a home to come back to after the storm. When Florence decided to stroll through North Carolina at 2.5 miles per hour, we imagined our home swamped under 34 inches of rain and a tidal surge. We were fortunate to have some information from people who stayed behind. Likely we will not be so lucky the next time as none of them are planning on staying for the next big hurricane. The picture in the post was taken by a good friend from our upper deck after it became safe enough to go outside. If you look closely around the pool fence, you can see what is probably the high water mark. This is a link to similar picture with normal water height. While we were not here to see the water at its worst, we estimate that it was three feet higher than Irene. Our garage is only twenty-five feet from the water so it did not surprise me that the garage floor got water on it, but fortunately our house is several feet above the garage floor. We got no water in the house and only minor damage with a few pieces of soffit coming down onto to our upper porch. Considering Florence has been called a once in a thousand years flood, we feel blessed to have so little to deal with from the storm. Florence was by far the worst storm to hit the Crystal Coast in our twelve years here. Those who lived closer to the ocean than us did not fare as well. We have yet to make it to one of the beaches but hope to do so in the next few days. Services are returning to normal but there are still parts of Cedar Point and Cape Carteret that are struggling with their Internet and phone service. Some of the restaurants have been running on reduced hours. Many of the restaurants located in older building will be a long time reopening. As someone wisely said, the one piece of infrastructure that did not break in Eastern North Carolina was people. Now the people are coming together to rebuild. I am sure the Crystal Coast will be ready for visitors well before next beach season. We feel lucky to live in a subdivision where the power was only off for thirty hours. We returned to find that the soft butter in our fridge had not even melted. As I hear the chain saws running every morning, I am glad we have no trees around our home. This is a link to some pictures taken during and after Florence. If you click on the “I” button, you will get some information about the picture. I will be posting more as we get out and about and visit some beaches.